As many dear readers will know, I am president, founder, chief executive, member #0001 of long-running organisation “The Telegraph Pole Appreciation Society”. In this role, I am honoured to have as esteemed member number 666 Mr Dave Bennett from Wilton in Wiltshire. Dave is a tub-thumping archaeologist collector of images of tall things. He is also a very fine artist and cartoonist. 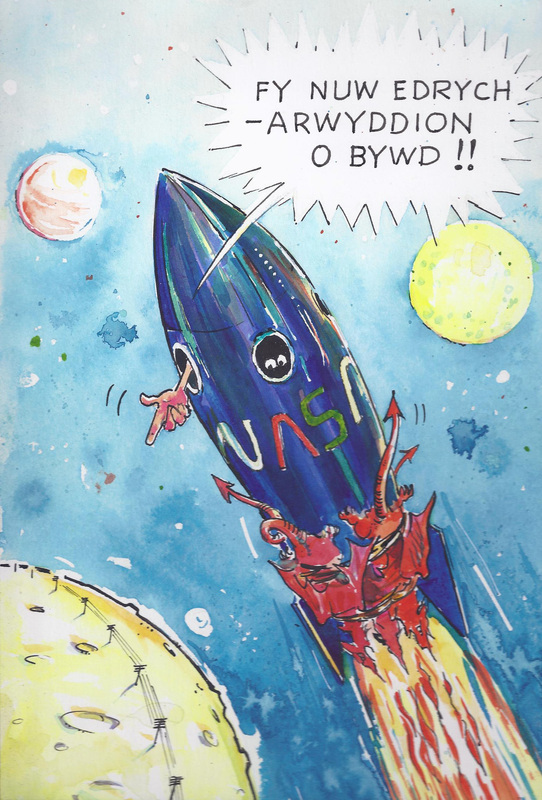 And when, from our many emailic conversations, he found out about another of my whimsical wastes of time “The Welsh Space Agency (W.A.S.A.) it seemed to strike something of a chord and he sent me the two artworks you see below – the second as a Christmas present. Dave, or course, also kindly gave us page 36 in my award-winning* book T.P.A.F.B. (Key Stages 1-4). For the second image, Dave valiantly approached his son Ben’s mate Griff’s mum for her version of the Welsh caption. He also then condensed this with a version from Google translate and it is near enough for me to tell you that it says “Oh my God look! Signs of civilisation”. 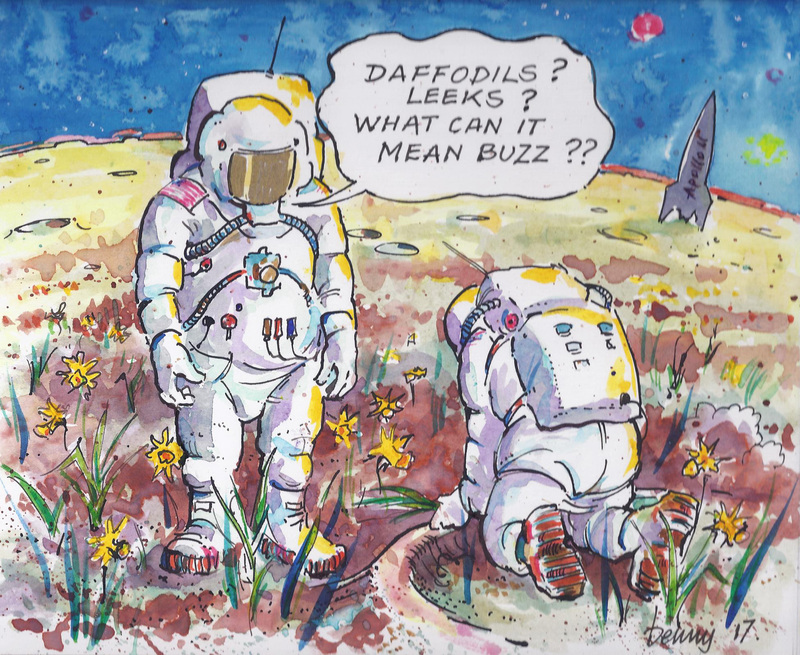 And with this one cartoon, Dave neatly captures two of my obsessions, Wales in Space and of course telegraph poles. Due to it not fitting fully on my scanner, I’ve alas cut off his trademark “Benny” signature from the WASA image. Thanks Dave, I am indebted to you. * Largest pile of unsold books stored in a pantry, 2017. If you were to doubt, in any way, the problem our world has with plastic – a beach litter-pick is both catharsis and enlightenment. 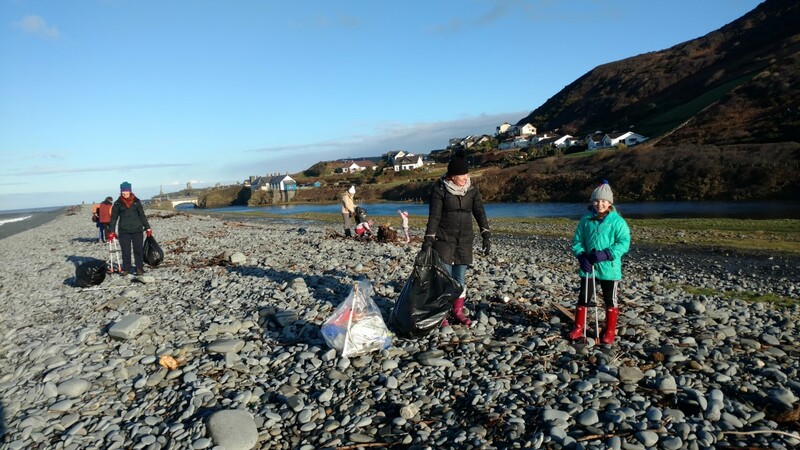 Two hours, a dozen or so volunteers and a truck load of washed-up rubbish – a feel good way to spend a Saturday morning. 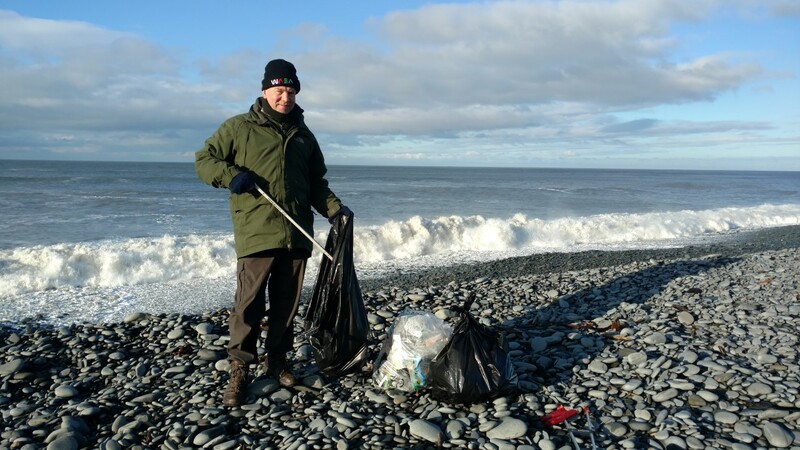 This was Tan-y-bwlch beach, Aberystwyth and had only been litter-picked a matter of weeks ago. The pile in the bottom pic was the tally after 2 hours. 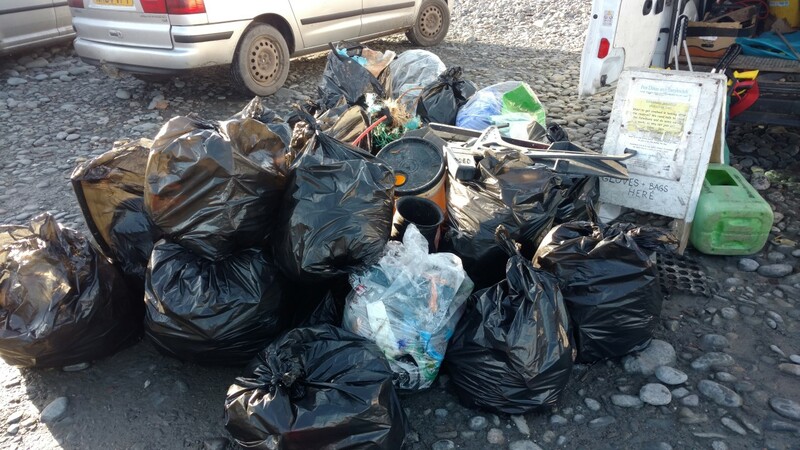 By end of the day on Saturday 450kgs had been collected. Breathtaking. Thanks be to Aberystwyth Beach Buddies for their organisation.